The Washington County Commanders faced adversity with several injuries plaguing the team at the start of the week. Drew Yates didn’t play during either of the early week contests against Adair County and Green County due to injury. During the Adair County game, Devin Hurst was injured and wasn’t able to play against Green County. 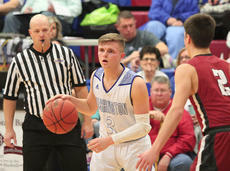 Additionally, Josh Burkhead was sick and unable to play in the game against Green County. The Commanderettes are moving on in the 19th district tournament after beating the Nelson County Lady Cardinals 59- 51 on Monday. 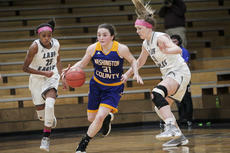 They advanced to play the Bardstown Lady Tigers Tuesday night after press time. 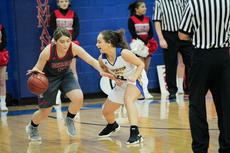 The game against the Lady Cardinals was a back-and-forth contest. 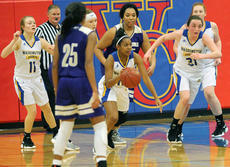 The largest lead of the night was only 10 points and that was held by the Commanderettes at the end of the game. It was a rough week for the Commanders as they went 1-2 with the two losses being very close games. First up the Commanders faced the Bullitt Central Cougars. The Commanders were close the entire game but just came up short in the end. The first quarter was neck and neck with WC down one 14-13. 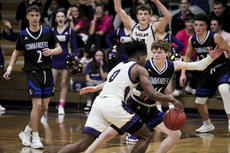 Cameron Willis had a pair of 3-pointers, and Drew Yates added another one. 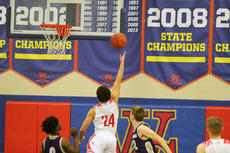 Devin Hurst and Jake Yates both scored 2 points. The Commanderettes had an amazing week winning two of their three games. 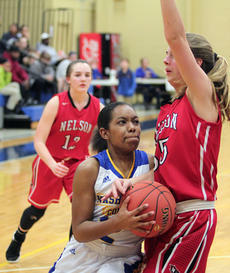 The first game of the week came against the Shelby County Lady Rockets. The Commanderettes jumped out to a quick first quarter lead of 15-7 and never looked back. 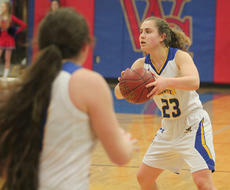 Amber Murphy had a big first quarter scoring 8 of the Commanderettes 15 points. Madison Snellen had 5 and Maddy Riley had 2 wrapping up the Commanderettes 15 points. “Well, I thought that our effort was better than it was last night but I still think that we made a lot of mistakes that lead to us being down a lot early,” Bramblett said. 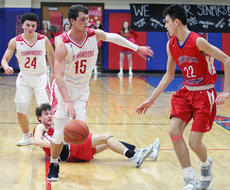 After the Washington County Commanders 61-47 district win against Thomas Nelson, the Commanders have now clinched 1st place in district play for the first time in school history. While that’s a point of celebration for Commanders head coach Bernard Smalley, he said that’s not enough. Even still, the Cardinals managed to derail the Commanders, snatching a 71-68 win in Saturday’s game.